No, it isn’t a popular SUV with a few letters missing – the Cadillac Escala Concept pictured here is touted as a “more expressive, expansive companion” to the current range-topping CT6, the carmaker says. Intended to showcase future design and technical systems currently in development, it’s set to debut at this weekend’s Pebble Beach Concours d’Elegance in California. “The Escala is a concept with two clear objectives. First, the Escala is a statement of intent for the next iteration of the Cadillac design language, and also technical concepts in development for future Cadillac models. Secondly, the Escala builds Cadillac’s aspirational character, signaling the brand’s return to the pinnacle of premium,” said Johan de Nysschen, president of Global Cadillac. At 5.35 m long, the Escala (Spanish for “scale”) is about 15 cm longer than the CT6 sedan – emphasised by the “liftback” design with a sloping roofline towards the rear. The face wears a new Cadillac design that will appear on its production cars soon, and features slimmer OLED lighting that is set deeper within the fascia, creating a more sinister look. The wheels measuring 22 inches and feature a double-layer spoke design. 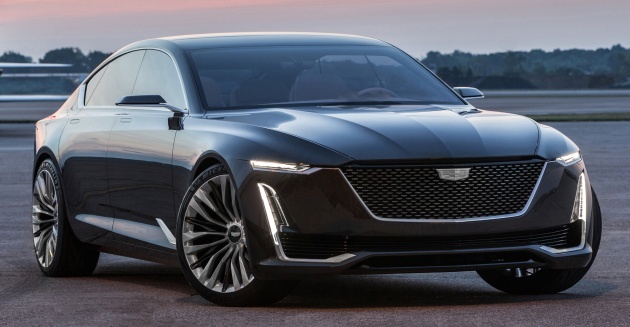 The Escala Concept is powered by a new 4.2 litre, twin-turbo V8 prototype engine, the first in development for future Cadillac models, with Active Fuel Management cylinder deactivation technology enabling the engine to operate on half of its cylinders at lower throttle loads. It sits on the company’s new rear-biased large luxury car architecture with mixed material construction, which debuted on the CT6. Cadillac says the Escala Concept’s interior – with the front of the cabin focused on modern technology, and the rear on relaxation – is assembled with hand cut-and-sewn techniques, like all of its current models. New touches include hand-tailored fabrics used on the door trim and seating areas, which is said to be inspired by suiting material used in the fashion industry. Up front, the driver is faced with three slim, curved OLED screens that layered one in front of the other – the back sides of these are wrapped in leather and embossed with the Cadillac script. As such, the gauges and the centre display have been integrated into a single unit. The Escala also employs new designs for connectivity and control, where a central control enables the driver to execute tactile commands across its range of functions, along with voice control and gesture control technology. The controller features a new version of the company’s heritage “flying Goddess” icon. still waiting for a production versiob of the CIEL concept…. The vast majority of interior designers in Malaysia are crap, I repeat, crap. The workmanships are even worse. Nowadays, youngsters learn a bit here and there and call themselves si-fu; most of the work are then done by inexperiened workers. And, they don’t have rulers. You are cheaters, your Ninja King are bought with dirty money. Owh please stop doing design like this. Getting bored already. All the same. Finally some new direction for Cadillac styling. I thought the designers were brain dead already recycling the trapezoidal pattern in their cars for the last 15 years.